Daniel McLaren has built a Facebook friends visualization using his own flash-based graph visualization tool called Constellation. The interface lets you see which of your friends know each other. 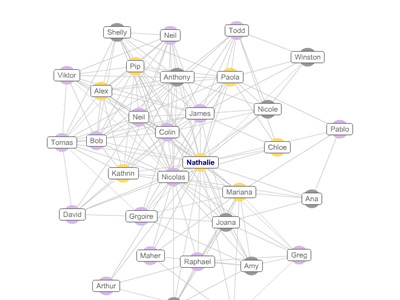 At any given time it will show one of your friends as the selected node (in bold), and any mutual friends as additional nodes. 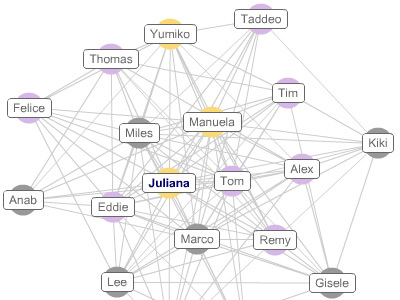 Lines between nodes represent friendships. Clicking a node will select it and you and the new person's mutual friends will appear. Finally, the colour of the circles represents gender: yellow is female, purple is male, and grey is unknown. The information cannot be retrieved all at once so you'll find that the visualization will constantly change as more information comes in. It takes a while to load the data but it (usually) gets more interesting the longer you wait. Watching the nodes re-arrange themselves is fun, but also processor-heavy. If you have a lot of friends the CPU load will be pretty high.